Most pet cockatoos spend their lives - which is usually 50-70 years in a cage. Often the cage is smaller than this. Is this a life for a loved pet or a life sentence? 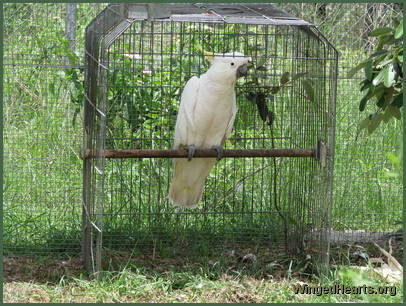 Most cages are less than 750 mm square. 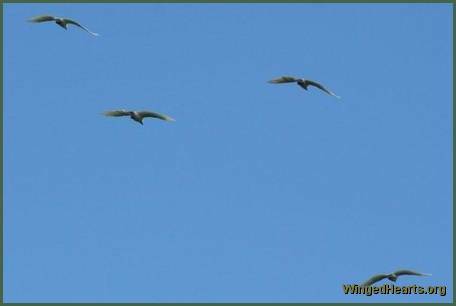 Too small for the a bird with a wing span of nearly 1 metre (3-4 feet). 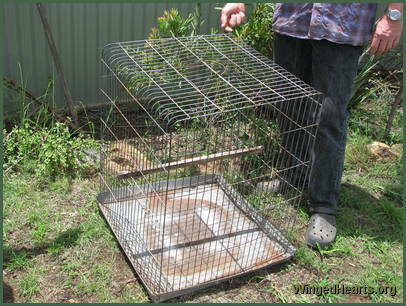 The wire mesh and metal (or concrete) floor causes permament damage to the birds feathers and claws. The birds also suffer from arthritis and cramped toes sitting on perches totally unsuitable for them. 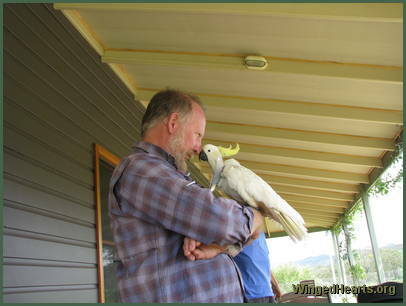 Cockatoos are intelligent, friendly and communicative birds. Not only can they be taught to talk to humans, but in their own groups they stay in constant communication with each other. 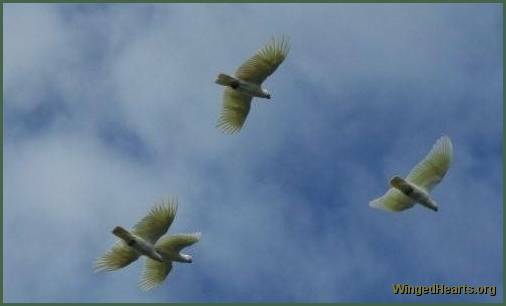 Cockatoos are flock birds, they fly high and have large territories spanning 30-40 kms (20-25 miles). 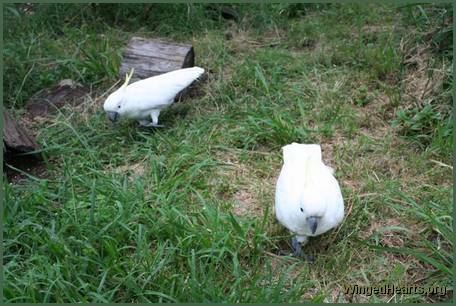 Cockatoos also spend a lot of time foraging on the ground. They thrive on a variety of raw foods including a wide range of grasses. herbs, seeds and need plenty of branches and bark to chew on to keep their beaks from growing too long and preventing them from eating properly. They like to dig hollows in the ground and often lay their eggs in these hollows. 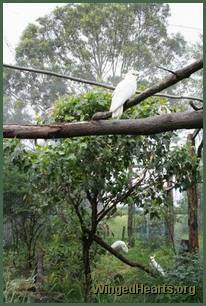 Birds in care need a large, spacious aviary with natural foliage and trees. 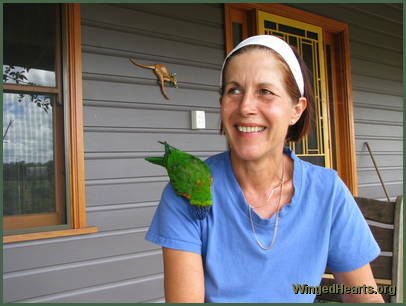 A wide range of perches enables the birds to flex their claws and feet muscles. Proper placing of logs high above the ground also gives flightless birds the opportunity to walk around a natural bridge to exercise. Ground with grass, weeds, fallen bark and other normal soil objects provide a natural floor which lets the birds potter and dig hollows and catch ground insects as they would in their natural environment. 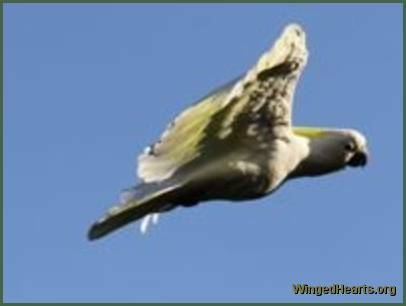 A bird in full flight gets to exercise all its muscles. 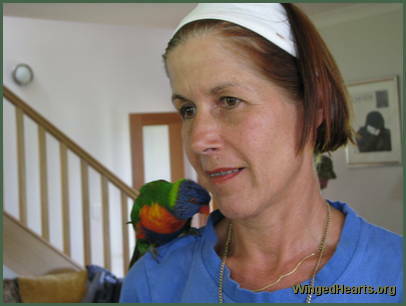 Gabrielle Friebe with Jack the Rainbow Lorikeet, another rescued bird. 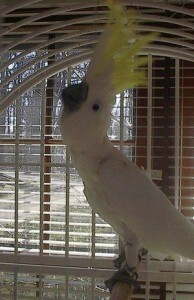 Charlie Girl has become the mascot of the cockatoos. 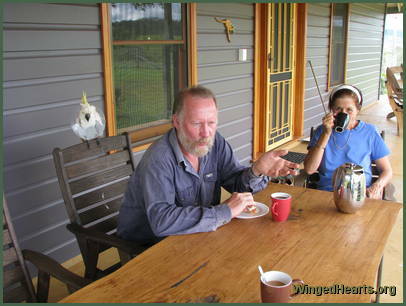 She was recupertaing from a hernia operation when we visited Gabi and Pete at their Long Grass Nature Refuge. Charlie Girl kept us company throughout, keen to show us just how much she appreciated the love and care that she had received from Pete and Gabi. 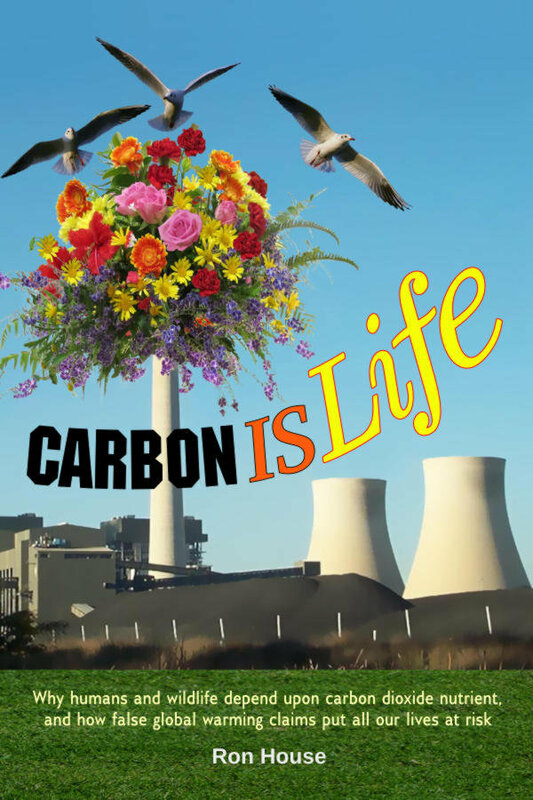 Later as we prepared to leave, she confidently pottered round our feet, smiling and nodding, letting us know in her way that she values her second chance at life and freedom. Jack concurs - he is ever so happy to hop around Gabi's shoulder.